Winding thru the forest along the riverbank you exit the forest and high ridges and immediately enter the city limits of the historic resort town of Gatlinburg Tennessee. Gatlinburg is cradled in a small valley at the very base of the Smoky Mountains surrounded by mountains in every direction creating a feeling of separation from the rest of Sevier County by its own natural boundaries. Gatlinburg was a backwoods mountain community until a national event took charge of its destiny. 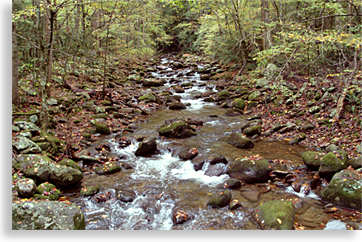 In 1934 the Great Smoky Mountains National Park was established and the optimists saw Gatlinburg as a great tourism opportunity. With the official dedication of the National Park in September of 1940, Gatlinburg Tennessee was off and running and is still running at full speed today as a premier resort town and vacation destination. Sevier County is the gateway to the Great Smoky Mountains, its Parkway (US 411) runs thru Sevierville, Pigeon Forge and thru Gatlinburg creating a corridor to the Great Smoky Mountains. Gatlinburg is the physical doorway to the Great Smoky Mountains National Park, when the city limits end on the south end of the town of Gatlinburg the Smoky National Park begins. 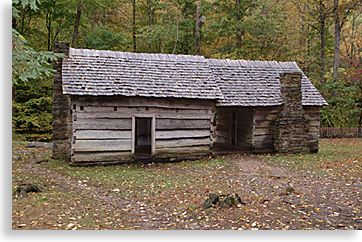 Gatlinburg’s first official residents were believed to have arrived at the turn of the 19th century. A widow named Martha Jane Huskey Olge and her 7 children along with other settlers helped establish a community called White Oaks Flats named for the many White Oak trees in the area. Her rustic cabin still exists near town, along the Roaring Fork Creek. Radford C. Gatlin a new local store owner found favor with the local postmaster when he allowed the post office to be operated out of his store. In gratitude the postmaster officially changed the name of the community from White Oaks Flats to Gatlinburg in 1855. Radford Gatlin was considered by historical record, as the pushy ambitious type; acting on opportunities to gain land during the early days of settlement which ruffled the feathers of the local mountain folks. Gatlin being a newcomer became quite unwelcome in the new found town of Gatlinburg, his stay lasted less than five years. I’ve always enjoyed Gatlinburg, it is a genuine mountain resort town, with new amenities layered amongst an aged ambience that makes it clear that “you're in the mountains and glad to be there.” Though the parklands of the Great Smokies are at the other end of the street in Gatlinburg you hardly notice. All eyes are on Gatlinburg when you arrive, so much to do, so much to see. Gatlinburg provides an inexpensive trolley service for visitors; a convenient way to get around town; although Mrs. Highlander and I prefer to stroll. Being an older town confined by small mountains, steep hills and ridges, Gatlinburg is clustered like a village with everything right at hand. The trolleys does come in handy if you’re heading to the edge of town it’s the old downtown district that sees most of the foot traffic, a true walkabout metropolitan. From the flat of the Parkway in downtown main-street the town rises upward, clinging to the slopes surrounding Gatlinburg. There are shops and galleries, restaurants with fine dining and local eateries by design. There’s live entertainment along with museums and arcades, a 32-story Space Needle, a chair lift, and a large Aquarium. 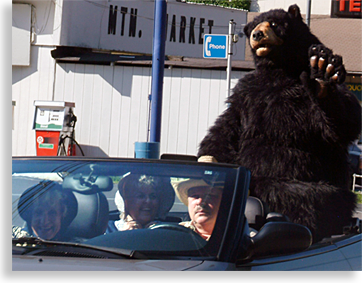 While visiting Gatlinburg you’re likely to run into a particular black bear roaming the streets, hitching a ride, generally just hanging out. It’s a strict policy that wildlife should not be fed by human-kind. So, if this friendly, furry, natural aborigine approaches you or your family and eloquently pleads for your attention in regards to culinary delights kindly decline while enjoying the presence of his or her jolly character. The community of Gatlinburg provides all of the needs of this forest creature including transportation and dry-cleaning. A unique feature Gatlinburg has to offer is its original settlement still intact along the Roaring Fork Motor Nature Trail. You will find access off the Parkway (US 411) in the heart of Gatlinburg. Within moments you can go from the lights and liveliness of today's Gatlinburg to almost perfect peace and quiet as it began. This loop drive takes you into the heavy forested cove where you can witness the original homesteads of the early settlers. Due to the intimate proximity of Gatlinburg to the national park, you can proceed past the last stoplight along the Parkway on the south side of Gatlinburg business district and leave the city sounds and sights behind as you enter the Great Smoky Mountains National Park. This level well marked trail leads thru the woods along the Parkway’s road US 411 to the Sugarland Welcome Center just 2-miles away, inside the national park. With each of the towns of Sevierville and Pigeon Forge showing off their personal dynamics, Gatlinburg truly sets itself apart in a cozy more intimate surrounding. Though the town has grown considerably since the national park's opening in 1940, and even with its crowded streets during the height of the season, its festivals and events, the town of Gatlinburg carries its charm of mountain dignity and hospitality like old friends inviting you into the comforts of their hometown. Arrowmont School of Arts and Crafts is a national art and craft education center located just one mile from the entrance of the beautiful Great Smoky Mountains National Park. The School offers weekend, one and two week workshops for the beginner to advanced artist, taught by national and international practicing studio artists and university faculty. Students work and learn in professionally equipped studios on our stunning 13 acre residential campus hidden in the heart of Gatlinburg, Tennessee. Workshops and classes are offered in ceramics, fiber, metals/jewelry, painting, drawing, photography, warm glass, woodturning, woodworking, mixed media, books, paper and more.